Here's a link to Bob Croft's office rehab (in Roosevelt, but hey, it's a really nice rehab). Our neighborhood's namesake would cross the country, Boston to San Francisco, for health reasons and begin a life that would affect so many lives in Downtown Phoenix. From wool to banking and finally oranges, Francis Quarles Story's success gave us a place to call home. When the for-sale sign went up in front of the yellow Ranch house, it signaled the end of one of the earliest chapters of F.Q. Story history. The house in the 1300 block of Lynwood Street was home for nearly 70 years to the Landy family. Lewis and Sarah Landy moved into the home in 1942 along with their five children. It remained a Landy household until Don Landy died last fall. People who have lived in Story for awhile would recognize Don from his frequent walks through the neighborhood and, if they were lucky, from his stories about a neighborhood most of us would not recognize. He worked at their father’s store -- Landy’s Market -- on the southwestern corner of 15th Avenue and McDowell. It closed in the early 1980s and was replaced by a Circle K, a very different type of operation from the mom-and-pop store the Landys ran. Don, in an interview five years ago, recalled the family home followed the family store. Initially, Lewis Landy ran a grocery store at 15th Avenue and Fillmore (site of the current Buster’s Market) The family lived across the street, on the northwest corner with the kids bedding down on the sleeping porch (see if you can make out the contours of the porch). Don remembered rolling down heavy canvas shades to block the light. A coal-burning stove kept them warm in the winter. 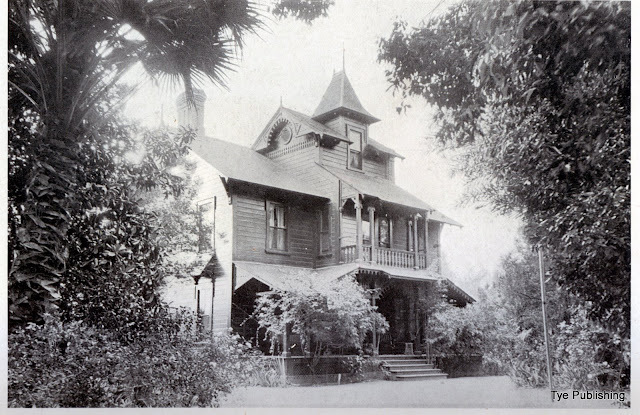 A few years after opening the McDowell store, the family moved into the Lynwood house they had used as a rental, Don said. To accommodate a growing family, Lewis added a half bath, giving the house a 1.5 BA attribute that was the envy of the neighborhood. Don attended Capitol Elementary, Adams Elementary for junior high and Phoenix Union High School, then started his higher education at Phoenix College. He graduated from Arizona State College (now ASU) and went on to teach at Westwood Elementary in the Alhambra School District. He later became Westwood’s principal. The family wouldn’t go far on its Sunday drives before they hit open desert -- an uninhabited landscape that raised doubts about the wisdom of a store so close to the city’s edge. But the market thrived, and a small strip mall developed around it, including a drug store, restaurant. Laundromat and cleaners. The store started home delivery, catering to households in Encanto-Palmcroft and Story, of course. Each December, the store stocked Christmas trees. Don bagged groceries, stocked shelves and marked prices. The store also drew servicemen who would get off the train along Grand Avenue and head to the store. Don remembers his dad handing out free sandwiches to the soldiers. With Don’s passing, the family opted to sell the house, which still contains many of its original details. Don’s sister, Betty, also lived in the house from her teenage years until her death in 2011. Betty Landy, who moved with her parents into a brand-new ranch house on Lynwood Street in the early 1940s, passed away in early February, 2011. Many Story residents will remember Betty for her walks up and down the streets of Lynwood. Betty, 82, was born in Phoenix and spent her early years at the family home at 15th Avenue and Fillmore Street. Her parents, Lewis and Sarah, ran a grocery store called Landy’s Market. When they added a second store at the southwest corner of 15th Avenue and McDowell in the late 1930s, the family soon followed, settling into a new house in the 1300 block of West Lynwood. Betty, then about age 12, remembered that folks thought her dad was crazy to open a business so far north: There was nothing there, she recalled in an interview. But business flourished along with the growing neighborhoods. Landy’s Market drew customers from Story, Encanto-Palmcroft, even as far away as Phoenix Country Club. The store had neighbors of it own, developing into a mini-strip mall as Costello’s Drug Store, a variety store and a restaurant hung out their shingles. As the market flourished, Betty’s father added a bathroom to the house to accommodate his growing brood (four boys and Betty). Kids at school marvelled at the family’s fortunes, figuring they must be rich to have two bathrooms, Betty said. She was always quick to add it was only a a half bath, but it still set the house apart. Betty went to school at Capitol Elementary, then attended Adams Elementary for 7th and 8th grades before going to Phoenix Union for high school. Those buildings are still standing today, but only Capitol still functions as a school. She and her siblings worked in the family store, which operated until 1984. Longtime area residents will remember Landy’s Market did home delivery; Betty remembers spending Saturday nights as a teenager, cleaning out the vegetable bins and the soda-pop area. She taught physical education her entire career in the Coolidge school system. A gym there is named in honor of Coach Landy. While she taught southeast of the Valley, Betty still made her home in Story, sharing the house with younger brother Don. Here's a llnk to a brochure (4 Mg) detailing the development of our neighborhood from 1921 to 1938. Years ago, when the Coliseum was THE only venue in town (before the arena was built) the Ringling Bros. Circus was held there every year, around the 4th of July. Upon arrival of the circus train at the train station downtown, the circus would parade the animals from the train station North on 15th Avenue to the Coliseum with no fan-fare. We neighbors living along 15th Avenue would be alerted that something unusual and exciting was occurring by our barking dogs, beside themselves with the presence of this strange and unusual affair. There were the circus people and the animals - lions and tigers and bears in their fancy horse-pulled painted circus caravans and llamas, camels, the fancy trick horses, and the elephants of course, all walking with their handlers and trainers. Once the circus run was over, there was another parade South on 15th Avenue back to the train station - but this time the parade would be posted in the newspaper and drew a crowd. People would come and line both sides of 15th Avenue to watch. It was something to look forward to, and now looking back it seems very much like a small town affair. Like many house hunters, Margaret and Preston Brown ranked the local school high on their list of priorities when choosing a home. So when they fell in love with Kenilworth Elementary, it was an easy step to buy a house on Lynwood Street. That was 68 years ago. The Browns were the second residents of the imposing house at 920 W. Lynwood Street, buying it from the Snell family for $5,200. Margaret Brown recalled that the house was painted cream when she and her husband moved in during the summer of 1935. Just off the dining room was a screened-in room with a cement floor. Margaret later hired Edna Green, who she said was THE designer of the time, to help her with house renovations. One of those touches included installing French doors from the dining room to the screened-in patio. The house came with a one-car garage and, typical for the times, no cooling save for a 10-inch fan. Lynwood Street in the mid-1930s was full: Every lot had a house on it, she said. Margaret recalls that dining in was common in the mid-1930s, although she also remembers lots of parties being thrown at the Westward Ho. Popular groceries were the Bayless market on Central Avenue as well as Cobbs Market, also on Central near Willetta. She shopped at the downtown department stores: Goldwater's, Korrick's, Porter's and Switzer's. By the time the couple's third child arrived in 1938, the Browns were looking for bigger quarters. They traded their Lynwood Street house for a two-story, five-bedroom home in the Alvarado neighborhood, behind what is now the Phoenix Art Museum. Amy and Harry Trittle moved into 920, completing the swap. Margaret Brown still lives in Phoenix, and granted this interview to Story's Historic Committee, which is researching the early days of the neighborhood. The City's Historic Preservation Office is a wealth of info as well a source for grants. Here's a brochure all about FQ Story from the HPO.